We unleashed Anthony Bailey on the high and mighty Festool OF 2200 EB. Is it, we ask, a beast or a beauty, or both? i must confess that this is the first time I have handled this machine, despite having worked with many routers, so I am coming at this without any preconceptions. It's big, there's no getting away from that, and powerful too, at a class leading 2,200W of input power - about as much as you can use freehand and without blowing fuses all the time. 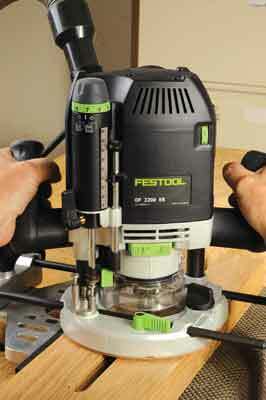 The design has all Festool's engineering hallmarks: solid, carefully considered construction, attention to detail and system compatibility. It can be inverted safely for cutter changing, then a paddle lever is pressed to engage a ratchet as you turn the collet nut, so that you don't have to keep taking the spanner off the nut - very natty. The collet itself is the standard large Trend, DeWalt, ELU type held in firmly with an O-ring and is available in a range of shank sizes. The plunge columns run in bushes, one being phosphor bronze, completely waggle-free and smooth in operation, the lock being a unique rubber twist knob on the left handgrip. The large round base has two 'chopped' faces to allow various operations and a clear plastic upstand to help contain dust, while on the right handgrip is a lever to launch a sprung clear shield that slides inside the base upstand giving full dust shrouding. This is important because there is a large integrated dust spout at the rear of the machine. The switch trigger is at the top of the right handgrip and is heavily sprung and can be locked on. The body has a variable speed thumbwheel and a speed guide to show which setting is which. Depth setting consists of two methods, one: the depth rod can be raised or lowered and locked by a large lever for coarse adjustment with an adjustable pointer against a scale. Two: with the locking lever on, a click-stopped rubber covered knob on top with a green increment scale can raise or lower the depth rod very precisely. In both cases the rod presses against one of three depth stops on the click-stopped turret below. The depth rod is a little waggly but settings are accurate. The base is something else again. With the router inverted a sprung lever is pressed to make the phenolic resin facing pop up. Then a guide bush can be inserted and one of several base facings installed: an extension base, standard base, small aperture base, flush trimming base and one with dust slots. A standard fence with long fence rods and a dust bowl is supplied and a fitting to work with a guide rail, all stored in an accessories case. If you want to own a big, powerful, precise machine that will last a lifetime this is it, but at a price of course. 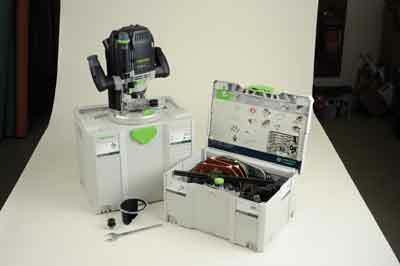 A variety of accessories are available and helpful free downloadable PDFs for a number of joinery operations can be found on the Festool website.